I have had a lifelong interest in working with textiles and threads even though I pursued a career as a planner and urban designer. Eventually the time and opportunity to work towards and gain a City & Guilds Diploma in Embroidery was available. 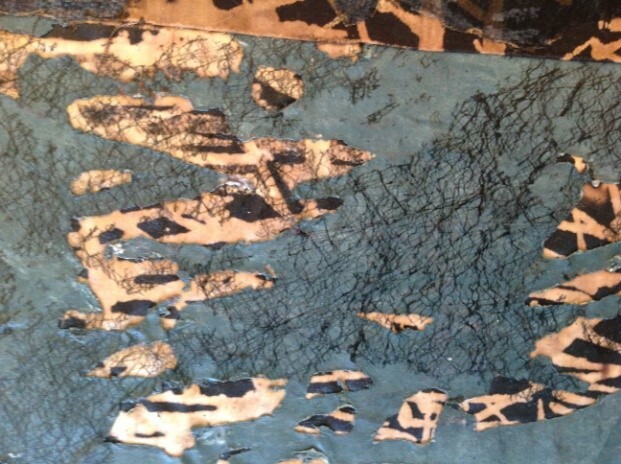 This expanded my interest in textiles and mixed media interpreted from various design sources. 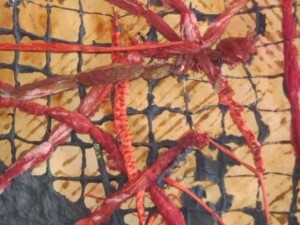 Additional courses have widened my fields of work with much time now spent on design interpretations in paper lamination, silk paper, felt and unique backgrounds created through dyeing, discharging and/or printing fabrics on which to embroider. Based on a theme of grids, I chose the quote from St Frances de Sales – ‘Do not try to be anything but what you are and try and be that perfectly’. The repeated text created the grid used in my series ‘Be what you are’. 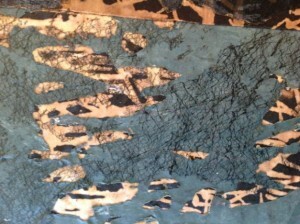 The piece, part of which is illustrated, involved paper lamination and discharged fabric. This was embroidered, painted and embellished. My piece ‘Nailed it’, illustrated, was an interpretation of my collection of burnished nails on three levels. The background to the piece was dyed using rusty nails and then printed before being embroidered with a variety of hand dyed fabrics and threads.